Tucked into a tiny corner in downtown Vegas, nestled at the end of Fremont Street near Denny's, is a hidden gem that will awaken the child inside all of us. If you can still fondly recall toys you played with when you were a youngster, then the Toy Shack is place that will come alive for you. From old X-Men figurines to plastic WWF stars and even old Ghostbusters memorabilia. What's more, there are old arcade games, a tall gum ball machine, tons of Hot Wheels, a collection of Barbie dolls, and the list goes on. There are rows full of toys from decades ago that will no doubt bring back lots of memories. Oh right, you've got kids in tow! Well the good news is that they won't mind spending time here either! 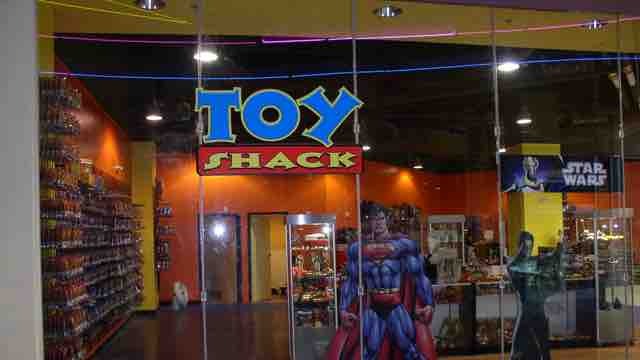 The Toy Shack sells toys for children six years and older. Your young ones will marvel at all the toys on display and of course, they'll press you into purchasing one, or two toys, or even ten! Prices will vary depending on the item being purchased and they are known to run high. However, a little bird told me that some prices are negotiable, so be prepared with a real tear-jerker about the toy that changed your life and see how things turn out!